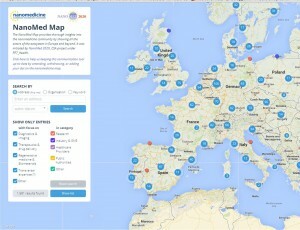 The NanoMed Map provides thorough insights into the nanomedicine community by showing all the actors of the ecosystem in Europe and beyond. It was initiated by NANOMED 2020, a Coordination and Support Action under the FP7-Health which started in September 2012 for a total duration of 18 months. NANOMED 2020 aims to deliver concrete recommendations to the European Commission to push forward the field of nanomedicine under Horizon 2020. Access the NanoMed Map here (external link, last accessed 30 Dec 2013).